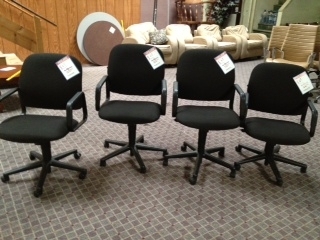 Ergonomic office chairs are some of the best furniture items you can purchase for the office. As many employees know, sitting in an uncomfortable office chair for hours is one of the most painful work experiences. Anytime you are sitting in an uncomfortable office chair, you are adding stress on your body, particularly your spine. To protect yourself from spinal injuries and overall back problems, you should buy ergonomic office chairs that offer plenty of lumbar support for your lower back, while helping you maintain good posture. So what ergonomic chairs are available for you? There are plenty to choose. Luckily there’s no ergonomic chair that’s better than another. You just have to find what’s best for your specific needs, that’s what makes the difference between a good ergonomic chair and a bad ergonomic chair. Buy an ergonomic chair that provides easy adjustments for seat height. The best adjustable chairs have pneumatic levers so you can adjust your seat height with ultra ease. Ideally an ergonomic seat height should be 16- 21 inches of the floor for utmost comfort for users. This height range will make sure the majority of users feet are flat on the ground and the arms comfortable on the office desk to help you maintain a good posture and prevent back pains. Pay attention to the seat width and depth. Ideal width is 17-20 inches; the ideal depth is 2-4 inches between the back of your knees and the seat of the chair. Buy an ergonomic chair with good lumbar support. What is lumbar support? It’s support for your spine because your spine has a natural curve. By having good lumbar spine support, you can sit at your desk for long hours without slouching over or straining your body. Good lumbar support means your chair offers excellent adjustment for seat height while offer good depth. Mark Downs Office Furniture is here to offer you high quality new and used ergonomic chairs and general office furniture. We are here to offer you excellent ergonomics no matter how big or small your office environment. We understand there’s a tie between work duties and how efficient people work based on their level of physical comfort. How do you interact with your work systems? How can you improve this interaction? We are here to help you figure that out today. Learn how the benefits of ergonomics by taking a look at our great selection of ergonomic furniture. This entry was posted on Friday, May 9th, 2014 at 1:18 pm. Both comments and pings are currently closed.